With Direct Ferries you can find a Ferry to Bodrum and quickly and easily compare with other sailings to Turkey or neighbouring countries to ensure you book the best crossing available. Our unique ferry price comparison tool will compare numerous sailing departures around your preferred option with all available ferry companies as well as crossings to other destinations in addition to Bodrum to guarantee you have all the information you need to decide on which is the best option in one fast and easy search! Getting a price or making a booking couldn't be easier. All you need to do is select your preferred Bodrum route from the menus, number of passengers and hit search. 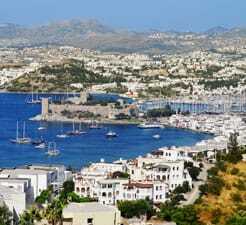 If you are looking for a Bodrum Ferry departure, please visit our Bodrum Ferry page.